After some time way from my garage and design activities I am back with a new idea. Combination of wood and plastic: The frame, the base and the dial will be made of wood. The wheels will be made of acrylic. Here is the computer design of the clock. The clock does not have a name so in invite my readers to suggest one. This is an old book! but a very good book for those who want to start building interesting things in wood. To practice and learn how to use and simulate mechanism in Fusion 360 I modeled all the projects in the book except two. What I found during this exercises is that Fusion is really friendly and essay to use for and also very powerful. It has some limitations with advance features like motion simulation and contact sets but for general design this things are not very important. The more I play with this software, the more I like it. The nice thing is that the support and the information available is very good. I modeled an AC motor to learn to use as much modeling tools as possible. The program is very similar to Inventor but at the same time more user friendly. It runs slower in my machine compared with Inventor but not a mayor issue. Below is a very nice tool that allows sharing the projects in a very interactive way. I am an experienced 3D drafter. In my day to day work I use AutoCAD, Invertor and SOLIDWORKS. I can switch from one to other without major effort. These programs are all very good and well recognized but at the same time very expensive for personal use. All these programs require to have a computer (powerful) loaded and with the licenses. For big projects you need a server to work on collaboration mode and the price of the license per user is several thousands of dollars a year if you need to keep the software up today. I have tested many open source 3D drafting programs and also Google SketchUp; some of them pc residents and some cloud based. I did not feel confortable or productive with any of them. This weekend I downloaded the demo version of Autodesk Fusion 360 and after a couple of hours I registered it and I I fell in love with it. I transferred some of my clocks models to Fusion 360 and started to play around. Then I decided to make a first full drawing of a part, in this case a RC Servo that I will use in a clock. Knowing Inventor the learning process was a piece of cake. The other good news is that Autodesk Fusion 360 has a very interesting offer: A free 1-year startup license is also available for hobbyists, enthusiasts, makers, and emerging businesses that make less than US$100,000 in revenue per year. At the end of 1 year, you can reselect the startup entitlement or transition to a commercial entitlement. After finishing the drawing it is necessary to use a program for generate the CAM to be able to mill or fabricate the parts. Mastercam is an excellent program but too expensive for personal use. I don’t know any good machine shop that does not use Mastercam. This program is the standard. I use BobCad-Cam V26 as CAM postprocessor because I bought it during an offer they had last year at a reasonable price, but I need to convert my work to DWG or STEP in order to run BobCad. The CAD part of BobCad V26 is not as good and flexible as other programs. I know they made a lot of changes in version 27 and probably is much better now but I am not willing to pay more for something I use for hobby and not for work. Fusion 360 has CAM as part of the package and also has the postprocessor for MACH3 that is the software I use to drive my small CNC. Now the work will be straightforward: Model – CAM – Mill with the same platform. The next step will be to create a model of a sprocket or wheel and run the cam to learn and test the results with my small CNC machine. This clock will go to the hose of a very special person for me and I need it not only to be nice but also accurate. the Conical pendulum is very inaccurate and also has some noise problems. With the changes now the clock is quiet and very accurate. I modified the clock to be driven by a 60 RPM synchronous motor. The pendulum has also a inertial wheel. I embossed 12 weights to the wheel. I also added a new guide for the pendulum rod. One of the things I love best from my profession and my hobby is when I can see in real life what I created in my mind. Technology is great for me because I don’t have the skills to draw by hand in paper so computers and CAD programs helped me to develop my creativity. Combining technical knowledge with creativity has been the most important tool for my work and now my hobby. The planetary clock was a challenge. The diameter ratio of the sun pinion to the planet wheels for 12:1 reduction and 8 teeth pinion is at the critical point. Too much play in the teeth can make the system to block as two planet gears can touch each other. Any eccentricity of the ring will block the system and if the teeth spacing is too tight the system will eventually lock itself. I had to mill more than three times all the parts making small design adjustments to adapt everything to the tolerances for wood. It is almost impossible to obtain tolerances in the range 0 .1 mm with wood so I worked with .5 mm tolerances to allow space for the natural expansion/contraction of the wood temperature and humidity. I also made tests with hot and cool room temperature. Below is a detail of the ring covers and the mill down of the sprocket area of .5 mm to allow some play of the planets in the axial direction. This also reduces the friction caused by expansion. Next picture is detail of the planet gears support, all made form a single piece of wood milled and carved with the CNC to obtain the shape and exact position of the arbor holes. Next was to make in the lathe the two circular bases, one is like a cup to hold the motor. The wood I used was so hard that I burned the small motor of the lathe. This is when a full replacement warranty is valuable! Next finish the wood assemble and glue together everything and pray that it will work as before wood finish. I have found that the best finish for wooden clocks is to use Danish Oil. it is not sticky dries relatively fast it is very easy to apply. One of the issues I always had with my small CNC 3040 was that I had to manually set the spindle speed in the frequency drive using a knob and chuting the speed with a tachometer. Each tool change or job type (rough or fine) requires different spindl;e speeds. I found in EBay a small electronic board that converts Pulse Width Modulation to an Analog voltage. It is possible to set the Match 3 software (this is the software that controls my CNC) to output a PWM signal in one of the port pins. The frequency drive can also be set to use a 0 to 10 volts signal to set the motor speed. It has some good information in how to calibrate the output. Below is the small PC board as I installed in the control unit. The circuit needs 24 volts for power that are available in the control’s power supply. The PWM input signal to the new circuit should be connected to one of the output pins. in my case I used the A axis on the CNC control board hat corresponds to the output pin 9. I spent a lot of time searching in the Internet for a manual until I found it in a Chinese site. Thanks to Google automatic page translate! The system works OK although it is not very linear but for milling plastics, wood and soft metals it is OK. I am very happy and it is working really good and helping me to avoid mistakes. Before engaging in building a multilayer planetary gear clock I decided to go step by step and create a “light” version with only the 12:1 gear and driven by a 1 RPM motor. I have a couple of timer motors the run at 1 RPM but the only problem is that the run counter clockwise and for this reason cannot be installed directly in the minute hand arbor. I also have one motor that turns clockwise, but is big and when I draw the model the clock looked like a fan with a motor in the back. In technology design and in many aspects I follow the concept of “Simple is beautiful” but some times adding some complexity to an an artistic kinetic device (that is what I think a wooden clock is), the complexity provides more visual action. 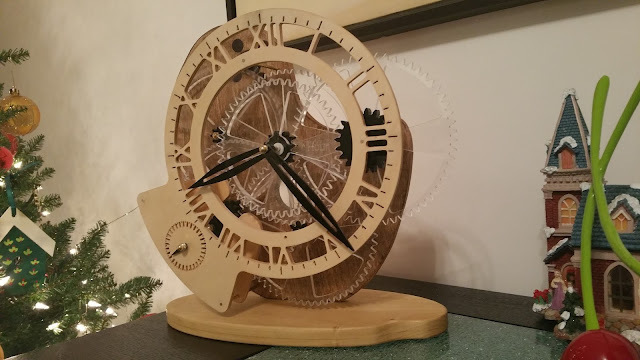 In this case I could use a couple of gears to invert the motion direction but it would be more or less the same as the motor will be exposed and the “magic” of the wooden clock will be diminished. My solution is, using Clyton Boyer’s words” drive the clock wit a pawl and click gear. 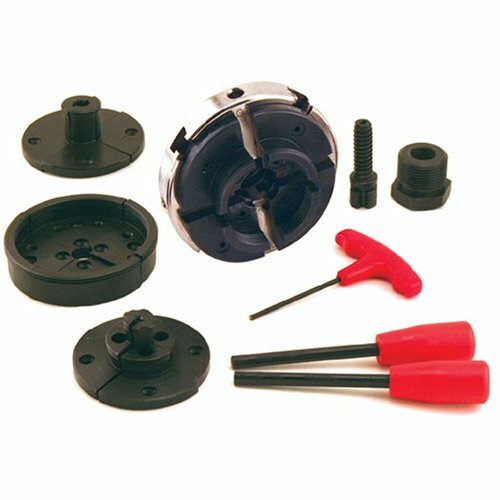 In other words: I cam lever with a ratchet or escarpment wheel. In the back view you can see the motor hidden in one of the bases and the small cam wheel that will make the escapement to advance one tooth each motor turn. Today I will start creating the CNC programs to mill all the gears. I love gears. There are so many combinations and possibilities that allows millions of combinations. This time I developed a clock wheel train based only on epicyclic gears. I will use three sets of planetary gears connected in series as a sandwich. the input must be oration of one turn per second. The clock will have the three hands: Hours, Minutes and Seconds. For diving this clock I will use a timer synchronous motor. I have to options one that makes one turn per minute and one that makes 60 turns per minutes. I have not yet made any decision. I already finished the 3D CAD model of the clock without the driving device and I think that this clock looks great! Projects need to be finished and this one is!. At the end is a very nice clock but not as quiet as I would like for a night table. It is quiet but still have a small hum as the coil is actuated with Pulse Width Modulation. I Could make it better but it would need a lot of electronics. It looks beautiful in my dining room buffet! Now I am adjusting the Arduino program to obtain the precision. This video was taken at night with no noise and the only sound was the tick tock of the clock. Finally after a long wait trying to find an excuse to buy an accessory to for my small wood lathe that is more expensive than the lathe itself I got it!! Got some reward cash back in a credit card and without thinking it twice I bought it. I just made a very small piece for my Pythagoras clock and now my I feel and understand the importance of a good chuck. I have several projects in mid with the lathe after I finish with my clock. Yesterday night I worked with the electronics and a little bit of programing. The Pythagoras mechanism is making tic tock for the first time. polish the arbor of the escapement wheel and reduce the play as it is too loose in the arbor and some times it touches the third wheel. I placed some washers but I thin I will need to mill a new escapement. This is a lot of work pending that will be done after I return from my business trip and find some time. I am very exited with this project this will be a fantastic clock! Today after work I worked in my garage to finish all the rest of the wheels in the CNC router: The hours wheel, the intermediate wheel. the intermediate pinion. I am really happy that everything fitted perfectly and all the wheel turns with almost no blockage. Anyway I need to disassemble all the clock to make all the wood finishing work and polish all the arbors. Now I will not be able to go back to my garage for the next 10 days due to business travel.